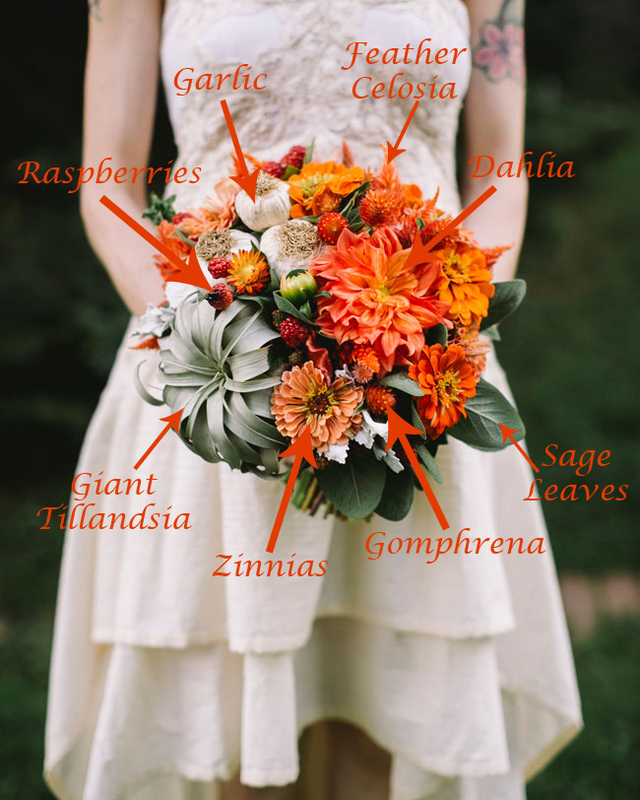 It’s Friday, it’s Fall, and just recently I was showing one of the girls in the office this wedding inspiration and bouquet breakdown that I shared on the blog last year…Why? Because I love it! So, I think it’s time for a Flash Back Friday post…Enjoy! Happy Friday Friends! Last week, Violet (our resident wedding flower planner) and I were ooh-ing and aww-ing over this insanely gorgeous wedding inspiration shoot featured on Green Wedding Shoes. You see, my boyfriend has a passion for food and cooking, and I love Fall weddings, especially when they include pops of bright orange, lots of texture, and natural elements like succulents, and this inspiration has it all! Yes, that is garlic in her bouquet! Pretty cool huh?! In addition to the garlic bulbs, there are Sage Leaves, Dahlias, Gomphrena, Raspberries, Zinnias, Feather Celosia, and a giant Tillandsia (also very cool!!). I love the unique and unexpected texture of the Raspberries and Garlic…the whole thing just works! So, I can’t stop just yet… Take a look at some of the stunning images shot by Love Me Do Photography, then you can see all the details and the full post on Green Wedding Shoes! Hope you enjoyed it! Now head to Green Wedding Shoes to see the full Inspiration Shoot!